The George W Bush Presidential Library opened today. Is it time to look back at Bush’s legacy? Early voting for the toll issue has started. How are the anti-toll advocates misleading people? What new information has popped up? 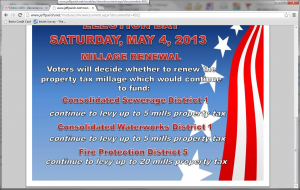 Are Jefferson Parish officials purposefully supressing the vote? And CISPA came up for a vote this week and it flew through the House. Does it stand a chance of becoming law? Is the law needed for our security or an overreaching governmental attack on our civil liberties. Those topics and more tonight on Liberal Dan Radio, talk from the left, that’s right. Vote YES on the tolls, again. 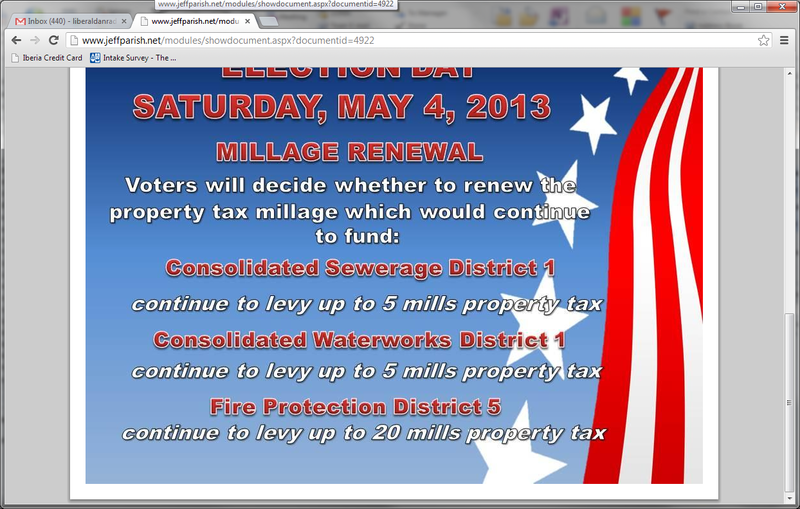 Early voting has already started for the May 4th election and the toll issue is up for a vote. The anti-toll advocates are at it again with their smear campaign of misrepresentation and lies in order to scare you into voting against the tolls. It has been suggested by some of the louder anti-toll activists that being for the tolls means you support every bad thing that has ever happened involving the tolls. Doesn’t that sound silly to you? Doesn’t that sound like someone who has no faith in the arguments that their side is making and as such has to just paint the opposition as corrupt? That is what it sounds like to me. 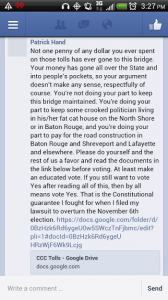 Some of the louder anti-toll activists have posted images on facebook telling east bank voters that the election is on the wrong date. Some of the louder anti-toll activists have even suggested that no money from tolls goes to the bridge. 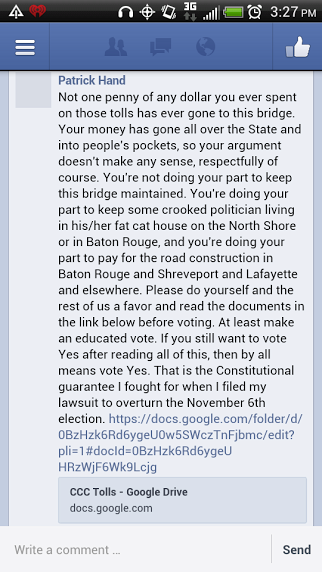 Patrick Hand, attorney for the stop the tolls organization put that little gem on Facebook today! Of course, when I asked Mr. Hand to prove his case he refused to. Some of the louder anti-toll activists have suggested that in suggesting that the ferries should be saved that Councilperson Palmer was being misleading and that people could interpret her words as suggesting a vote for the tolls is a vote to keep funding the ferries with tolls. Of course, nothing in that article comes close to suggesting that. But that doesn’t stop the dirty tricks on the part of the anti-toll crowd. And that is part of their tactics, they claim that the pro-toll side is using dirty tricks in order to cover up the dirty tricks of their own. Of course the worst dirty action by the part of the stop the tolls crowd was having a judge throw out 300,000 legally cast ballots from November. Some of the anti-toll advocates compare voting yes on the bridge to funding a contractor that charges too much for his work. However, I have found that such an argument is flawed because I would pay for the more expensive contractor if he would get my work done in a timely fashion and with more quality work. Some of the anti toll advocates say that by voting for the tolls you are voting to “trust government”. However, that is another false argument. Voting yes or no keeps the maintenance of the bridge under the arms of the government. It just allows you to pick which government entity you want taking care of the bridge. Do you want to spend less money and hand the bridge off to the state government that currently has a backlog of work that needs to be done? Or do you want to spend more money and keep the bridge with a dedicated revenue source that will maintain the bridge at higher levels as it has been. I don’t trust government as far as i can throw it. However, you have two clear track records here. And when it comes to maintaining the bridge, I choose to not support the method that hands the bridge off to a state government that is already doing a poor job taking care of its other bridges. And what does a dedicated funding source do for the CCC? Well, according to the report card on Louisiana’s infrastructure the bridge system of Louisiana has a D+ grade. That is not what I want for the bridge I cross every day to work. People in the anti-toll crowd will say that the state is mandated to fund the bridges by the federal government. That may very well be true. However, is D+ really good enough for you? There is also the final plan to eliminate extra lanes once the toll plaza is removed. That plan is shown here. I am not a traffic engineering expert. However, it looks like all General Degaulle traffic, as well as the Mardi Gras World Blvd traffic, will all be merged into 1 lane. That doesn’t seem to me to be a great plan to improve delays on General Degaulle. So at the end of the day, you should not vote for or against the tolls because of the tactics of the people on each side. At the end of the day the tolls should be supported based on the merits of the side you find more compelling. Voting for the tolls will absolutely not fund the ferries. Voting for the tolls will not magically fix the issues of where the toll revenue is spent. (And there has been waste an abuse in the tolls collected.) However, voting for the tolls will allow the bridge to have a dedicated funding source that will keep the bridge at a higher grade than the rest of the state. Voting for the tolls will keep the bridge from going to the backlogged list of bridges the state already has to maintain. Voting for the tolls will avoid the traffic pattern that has been proposed by the DOTD. And if the tolls pass, I am sure there will be plenty of people on both sides of this issue that will be putting the expenditure of toll funds under a very big microscope. So while having the tolls is not a perfect solution, I believe it is the better of two options that us voters are being given and as such I request that everyone vote for the tolls on May 4th. On tonight’s episode of Liberal Dan Radio, I will discuss some of the hypocrisies of the Tea Party Conservatives. First, they claim that Obamacare was passed against the will of the people. A claim that is both false and hypocritical based on a recent Senate vote. Then, they claim they don’t want government to “tread” on them but are more than willing to use government to read on others. Which will lead the discussion to the continued look at the SCOTUS prop 8 hearings. All that, plus headlines, words of redneck wisdom, and more all on Liberal Dan Radio: Talk From The Left, That’s Right. On this week’s episode of Liberal Dan Radio, the discussion continues about the Supreme Court hearings over gay marriage issues. In this episode I will discuss one of the items that was debated between the sides of the argument and the justices and that is if someone has standing to bring a case to court or to defend a ballot initiative for the state on an appeal. Is it smart for the anti-prop 8 people to argue that Mr. Cooper does not have standing? Should Mr. Cooper have standing? Are the rules of who can appeal a decision too strict? How does that apply to one of the local issues I have been dealing with. If time remains, I will discuss the remaining sound bites discussing the merits of the actual case. All that, plus headlines, words of redneck wisdom, and an update from Cool Mini Or Not. 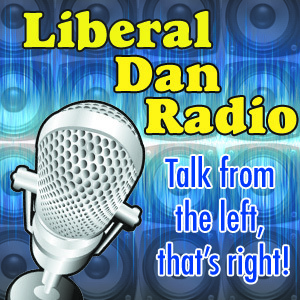 Thursday on Liberal Dan Radio: Talk from the left, that’s right.